Brec Bassinger is an American actress from the popular Nickelodeon series ’Bella and the Bulldogs’ where she played the role of Bella. She also starred on the hit series ‘Haunted Hathaways’. She is 5 feet 2 inches, weighs 48kg, her body measurements are 33-24-32, she has green eyes and dark brown hair. Born in May 1999; Brec Bassinger is currently 18 years old. She appears to have long legs and small feet as her shoe size is 7.5 U.S size. She was born in Saginaw, Texas on the 25th of May 1999. Growing up, she studied in Texas but later moved to stay with her mother in Los Angeles because she had juggle work and school. As a child, she appeared in a few beauty pageants and her parents have always supported her all the way. She won a few pageants like the Little Miss World in 2009, among others. At the age of eight, Brec Marie was sadly diagnosed with type 1 diabetes. She started her career in acting in 2013. Her first role was in a TV film “The Goldbergs” as Zoe Macintosh and she was in American TV sitcom “The Haunted Hathaways” as Emma from 2013 till 2014. In 2014, she appeared in Benny’s music video “Little Game”. While with Nickelodeon, she starred in the hit series Bella and the Bulldogs as Bella Dawson, in 2015, she appeared in Nickelodeon movie ‘Liar Liar, Vampire’ as ‘Vi’ and since 2016, she has been in the TV series School of Rock. In 2017 she acted in the movie ‘Status Update’. There isn’t a lot of information on her parents but she said in an interview that her father owns and operates a Koi fish farm and her mother is her manager. In October 2016, Brec was known to be in a relationship with Rick Garcia. Ricardo “Ricky” Garcia is a Puerto Rican Actor and of the same age as Brec. He is 5 ft 9in and famous for his role in the X Factor. Unfortunately, the two aren’t together at the moment. After numerous questions by fans, it was revealed Brec has moved on and is now dating Dylan Summerall. 18-year-old Dylan Summerall is also an actor who’s famous for his role in Angels Sing as Uncle David. He’s known to be very social and very active on his social media accounts. She has two older brothers Beric and Brice. When she moved to meet her mother in Los Angeles, the rest stayed in Texas. However, she still visits the family back in Texas. Brec Bassinger has a very active Instagram and Twitter social account with over 1.5 million followers and 85.6k followers respectively. 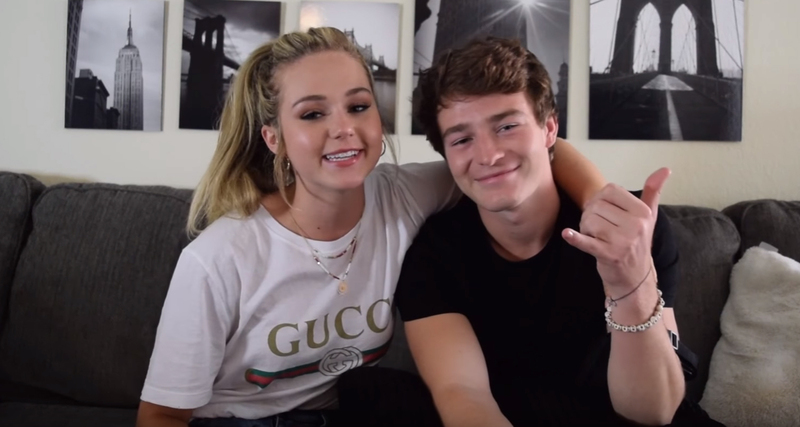 On Youtube, she has over 61,000 subscribers and has been very active for the past 3 months; uploading some question and answer videos for fans and posting videos of her and her current boyfriend Dylan Summerall. Brec Bassinger is estimated to have a net worth of at least $2 million. When it comes to football, Brec is a big fan of Argentine and Barcelona player Lionel Messi and she never misses him playing. In the kitchen, she knows her way around and loves to cook. Brec is known for having odd pets, she once had a pot-bellied pig as a pet and a naked mole rat for a pet. She is a secret singer as she explains but she hasn’t said anything about making a career out of it, we will just have to wait and see.